This study, resulting from long-form interviews with 80 journalists, finds that journalistic mission is in peril, because of lack of clarity around copyright and fair use. 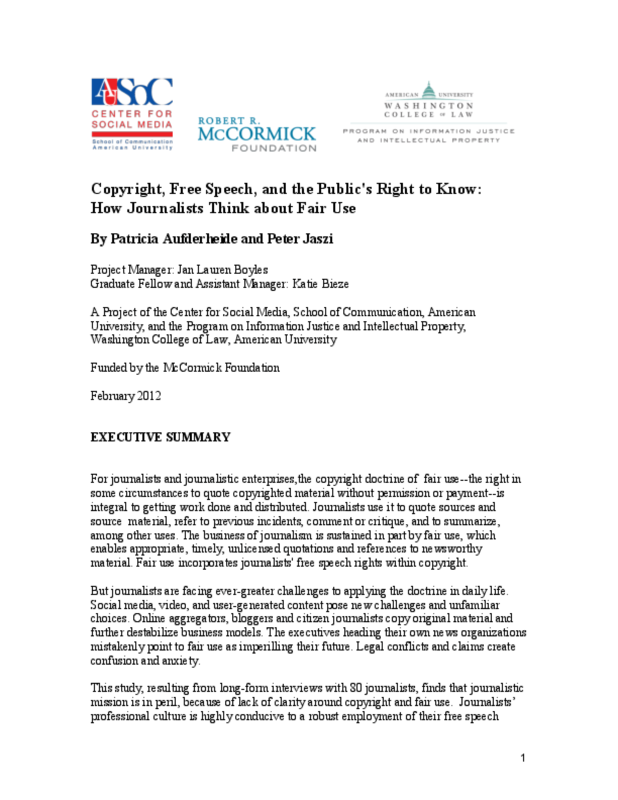 Journalists' professional culture is highly conducive to a robust employment of their free speech rights under the copyright doctrine of fair use, but their actual knowledge of fair use practice is low. Where they have received education on copyright and fair use, it has often been erroneous. Ironically, when they do not know that they are using fair use, they nevertheless do so with a logic and reasoning that accords extremely well with today's courts' interpretation of the law. But when they have to actively make a decision about whether to employ fair use, they often resort to myths and misconceptions. Furthermore, they sometimes take unnecessary risks. The consequence of a failure to understand their free speech issues within the framework of fair use means that, when facing new practices or situations, journalists experience expense, delays and even failure to meet their mission of informing the public. These consequences are avoidable, with better and shared understanding of fair use within the experience of journalistic practice, whether it is original reporting, aggregation, within large institutions or a one-person outfit. Journalists need both to understand fair use and to articulate collectively the principles that govern its employment to meet journalistic mission.